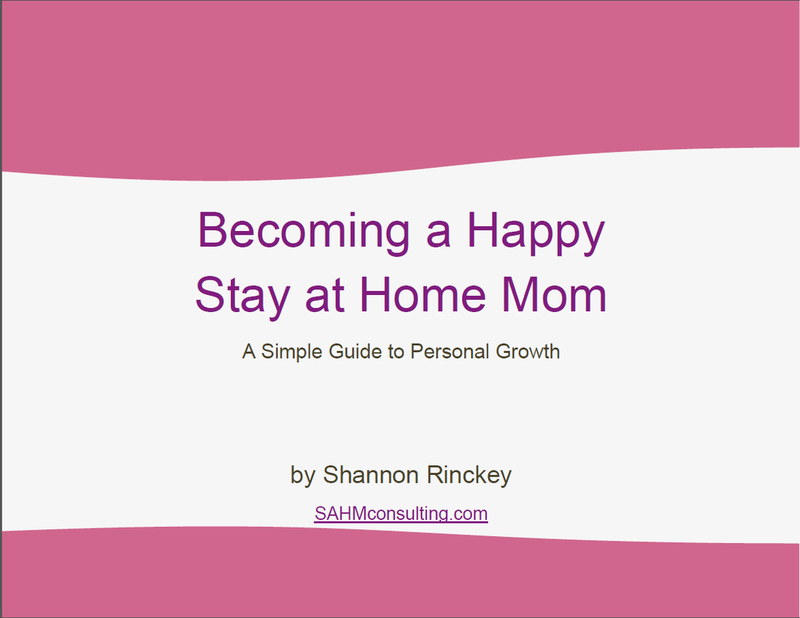 Becoming a Happy Stay at Home Mom is an eBook for Stay at Home Moms (SAHMs) that are bored, lost, lonely, and frustrated with life at home, and are ready to do something to change it. Have you lost your sense of self since becoming a SAHM? Do you wish others took you more seriously? Do you wish you took yourself more seriously? Are you convinced that you are boring and your “glory days” are through? Do you feel like you weren’t cut out for life as a SAHM, but guilt keeps you from entertaining any other option? More often than not, do you feel like you aren’t doing that great of a job at home? Are you secretly resentful that you are a SAHM? I wrote this eBook for you … because I’ve been there, too. Upbeat, positive, and honest (no whining or complaining … but not sugar-coating either). Encourages women to stay home and do a great job at it. Simple steps you can take to improve yourself and your outlook on being home. A focus on your emotional well-being and it's impact on your job as a SAHM. Created by a SAHM with a Master's degree in Marriage & Family Counseling, with a business and communications background, and with a good attitude to boot … oh, and not to mention someone with actual hands-on experience as a mother of five. Confidence that you are capable of doing this SAHM stuff really well, but maybe your head was just in the wrong place. You aren't so wrapped up in the petty parts of being a SAHM that you can't see the big picture: raising your children to be good people. Healthy, balanced view of being a SAHM instead of over- or under-hyping it. Take yourself more seriously, see what you do as a SAHM is a valuable gift you are giving yourself, your husband, and your children. Realize the importance of your overall well-being when it comes to taking care of the ones you love. Definition of an unhealthy relationship with yourself. Roles that we play to keep ourselves from feeling insignificant – specifically what those roles are, how they help and hurt us, and how to get rid of them. Identity Loss. Why it’s so easy to lose ourselves and what to do to “find ourselves” again without having to go to a mountaintop monastery in the jungle for six months. Self Doubt. Do you ever put yourself and your ideas down – especially when it comes to sharing with people outside your home? SAHMs deal with this a lot. I’ll tell you how to kick it to the curb. Boring Yourself. When we get bored at home, we do all kinds of crazy to get excited about life again. How to go about this without buying ten puppies or becoming a weirdo on YouTube. Feeling Ashamed of being a SAHM? Once we don’t know who we are anymore and we’re full of doubt and boredom, it’s easy to be embarrassed of that – and blame it on being a SAHM. There are plenty of boring people in every profession – it’s a matter of keeping your head in the game than being a SAHM. How to tell if you have a healthy relationship with yourself. So, I’ve got 5 kids, and I’m home with all of them. Every day. There have been days, oh my, there have been days. I am talking stressus maximus. Yes, in Latin, because English just doesn't seem to encapsulate the entirety of the overwhelm I have experienced in my day. Let’s just say, at my worst, I wasn't an enjoyable person to be around. I could tell that my husband was less interested in what I had to say, and my kids were even more irritable and less affectionate with me. YIKES! I realized that I was really not happy at home anymore – but felt like I couldn’t stand being away from the kids, either. I felt stuck. Some good came from it, though. It was the wake-up call that I needed to change my attitude and work habits so that I could be more pleasant and easy-going (like I was before having kids). I created Becoming a Happy Stay at Home Mom because I needed it. I needed to understand that what I was going through was not unique, that it’s ok to have a tough time when going through a transition, and so that I could ENJOY being a SAHM. Your children's memories: How will they remember you once they’re grown up and gone? Stressed out and always complaining about being "stuck home?" Or happy and confident and calm and not in a hurry? It's up to you how you come across. Your husband's attraction to your attitude: How you approach your job as a SAHM tells your husband a lot about what you think of him and the life the two of you have created together. What are you saying to him? And let's both be honest here, husbands are more attracted to wives that are happy, sweet, and generous, not closed-off, hostile, and overwhelmed. Your emotional stability: Some women are so unfulfilled and resentful at home. It really makes me sad because I know exactly what that feels like. Unfortunately, they never figure out the source of their frustration and end up sabotaging key relationships. Many of these women may end up in long-term therapy and end up running circles around the real issue: finding a way to marry your true self to being a SAHM. You can circumvent this before it happens by being proactive and finding enjoyment in life now. Do you think Becoming a Happy Stay at Home Mom might be a good fit for where you are in your journey? 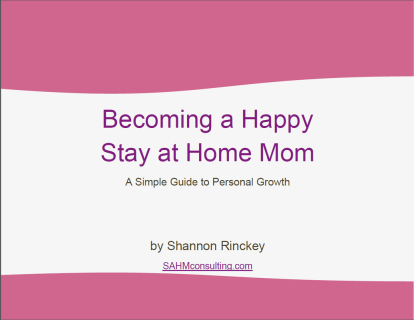 Becoming a Happy Stay at Home Mom is an eBook for Stay at Home Moms (SAHMs) that feel disconnected to themselves, are lost in the role of being an at-home mom, and know that life doesn't have to be frustrating and overwhelming ... they just aren't sure how to get there. This book tells my personal journey out of Role Playing and Identity Loss, and how I got happy to be a SAHM.